BEST SOLUTIONS PLACE’S PAYROLL SERVICE IS DONE IN CONJUNCTION WITH INTUIT QUICKBOOKS PAYROLL SYSTEMS. THE PRICE FOR PAYROLL PROCESSING AND TAX REPORTING IS $99.00 PER MONTH PLUS $2.00 PER EMPLOYEE. 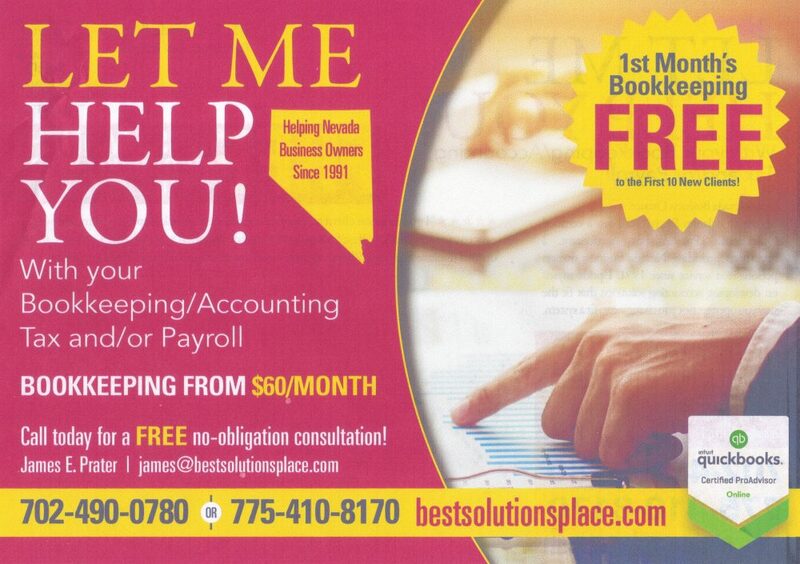 BOOKKEEPING CLIENTS SPECIAL PRICE OF $70.00 PER MONTH PLUS $2.00 PER EMPLOYEE. FORM 941 – EMPLOYER’S QUARTERLY TAX RETURN OF FICA AND MEDICARE TAXES. FORM 940 – EMPLOYER’S ANNUAL FEDERAL UNEMPLOYMENT (FUTA) TAX RETURN. FORM – NVRPT3795 – NV EMPLOYER’S QUARTERLY UNEMPLOYMENT TAX REPORT. NEVADA BOND – QUARTERLY BOND CONTRIBUTION RETURN. W-2 – ANNUAL WAGE AND TAX FORMS PLUS TRANSMITTALS. CONTACT ME TODAY FOR A FREE NO-OBLIGATION CONSULTATION! I am always available if you have any questions or concerns.